This time is it mostly about wire. I have just kind of played with this. The main thing you have to be aware of with wire is that it has ABSOLUTELY no stretch. You not only have to weave loosely, you have to weave a little more extra loose. The looms have a bit of a head on the pins which is great for yarn as you will not be popping your bit off halfway though weaving ending with a knotty wad of waste yarn, but for wire it’s not as great. You need to allow a little so that you can get your bit off the loom after you have it woven. I have manage to do that and not have to cut my square off but it’s been close a few times! In this photo you can see a copper wire, which s telephone wire stripped of it’s colored plastic coating. That’s at top left. Bottom right is fine gauge brass wire. Its easier to weave and makes a really fine mesh. The one in the center was warped with the fine gauge wire and woven with a metallic novelty yarn I had in stash. I have some others that naturally I can’t find for this post 😦 that I wove using chain. That’s a pile of broken chains of assorted sizes and types there at the bottom. You can also add beads to your warp or weave as you go. 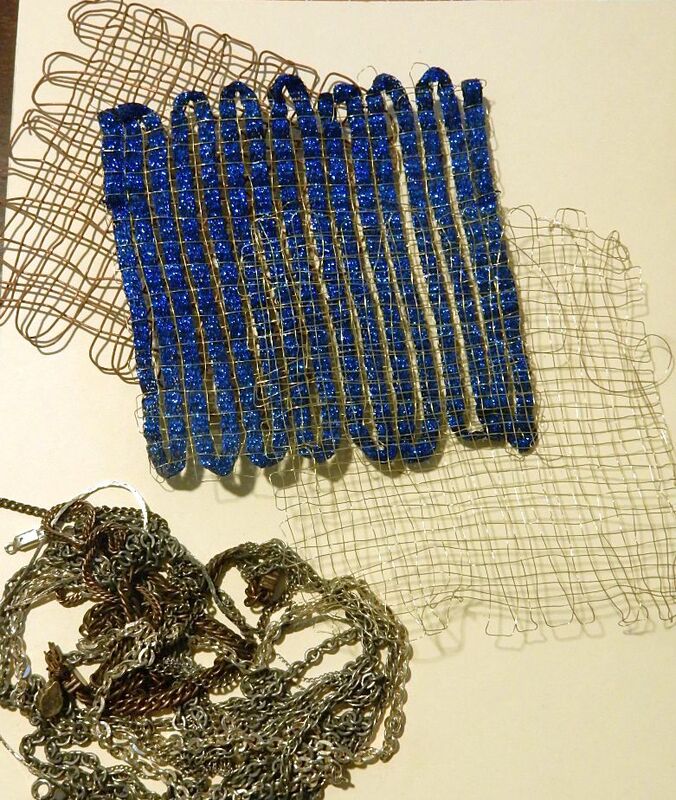 Be creative in using these wire squares. I saw a wind chime made this way that was very pretty. The weaver had used beads in it so it had a bit of sparkle. I used some in a “painting” for a gallery show. 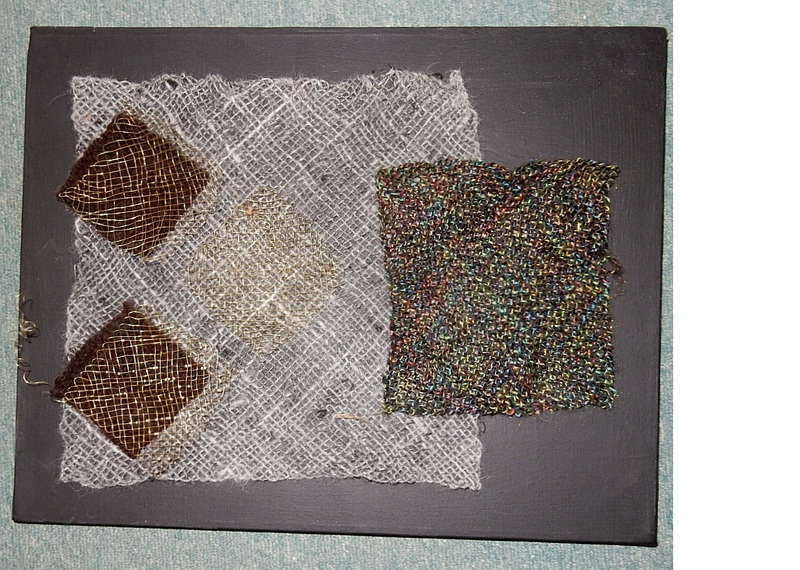 The canvas was painted black and I used some hand woven yarn under a couple of these wire squares. Some of them have curly ques at the sides which don’t show up well in my photo. Weavers also use wire to make jewelry so if you wear bracelets or earrings this would be a good use for your wire wovens. I hope to explore this medium further.